Lordy, I need a rest. Fourth Port Day in four days. Enough already. Lie in or no lie in, it’s still too much. We disembarked late, about half ten. Weather: overcast but mild. Very grey. We walked the length of the ship to get to the security gate. I spotted a Hop On Hop Off bus, so we walked back outside the security fence (almost the length of the ship, again) to the apparent bus stop and waited. A bus duly pitched up. The driver was very apologetic, but he was completely full. He said another would be along in 10 minutes and that we should wait right where we were for that one. We sat and waited. The next bus duly came, pulled into the parking area and drove straight past us like we weren’t there. Now, we weren’t the only people waiting, there were about half a dozen of us, and he DID have empty seats, I could see them, but he didn’t even brake. I will be writing a letter. That’s just not on. Granted, there’s not a massive amount to see, but it would have been nice to have seen what there was. We seem to have parked next to the main sight, which was the White Houses of the Old Town, but there were another 9 stops, there might have been SOMETHING of interest. But now we will never know, will we? Note: wherever you are in the world, if you get on a Hop On Hop Off with the red, yellow and purple livery, keep your ticket – it entitles you to a discount off the same company’s buses everywhere else in the world. So if you take a tour in York or London or Edinburgh, you get a discount if you present your ticket in Paris, Rome or New York. Of course, not much use to know this in Stavanger, where you will see buses but be unable to board, but I thought I’d mention it anyway. So we walked into the town. Luckily, most of it is waterfront cafes and shops, so it wasn’t far. We browsed and wandered with ease. We couldn’t find an open restaurant that did suitable food (plenty of closed ones, which seemed odd with 5000 cruise passengers about), so we had no choice but to refuel in Burger King, where the guy at the counter was just so relieved we weren’t another dozen shouting German teenagers (the Costa Fortuna was also in port – Germans love Costa ships), that he treated us like royalty. And it had a disabled toilet, so no stairs for mum. Nice touch. More wandering and shopping (H&M is really cheap here!) and then back to the ship by teatime. 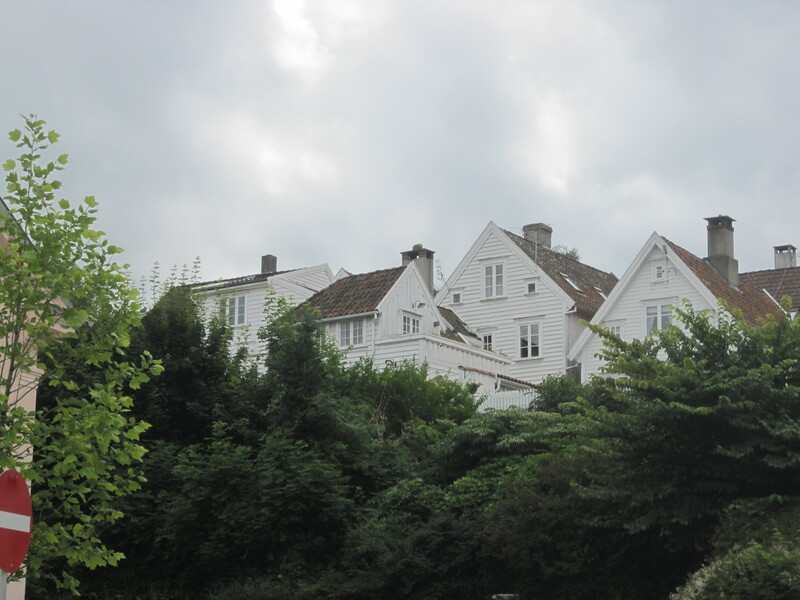 Stavanger is a fairly large city, but has very little by way of sights to see or prettiness to offer. Things to be aware of if you come to Norway: Salg is sale. Taak is thank you. Appel is orange, Eple is apple. Feel free to re-read that if you feel the need. Last formal night tonight. Black and White. Wearing the very dress, which I do love. It is very comfortable and seems completely uncreasable. I’m not sure which quality pleases me most! Dinner was lovely. The roast beef was superb, although the fondant dessert was very overcooked and no longer had a liquid centre. But we had a lovely time anyway. 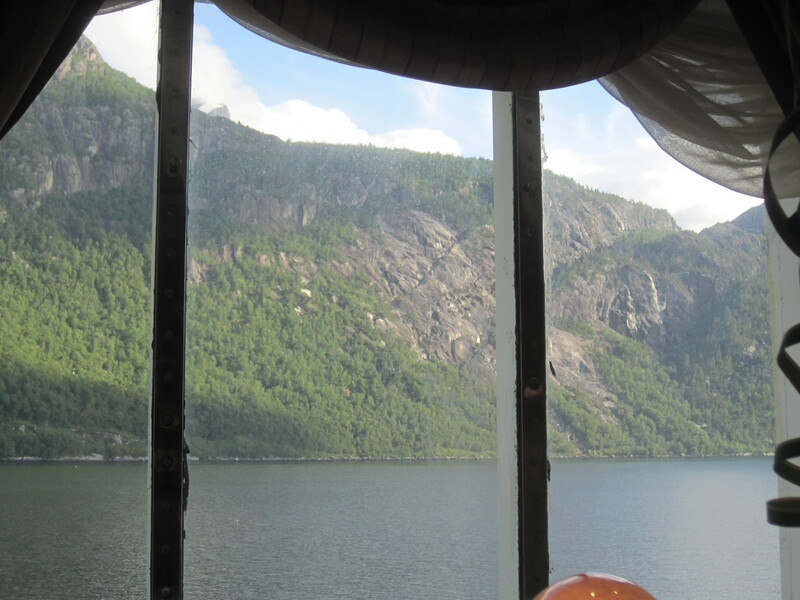 The continuing beauty of the landscapes we pass carried on throughout dinner as we left our last fjord. I took some photos so you can see what the view is like from our table. The bars in the picture are unavoidable, I’m afraid. They are there to reinforce the glass against large waves. The restaurant is on desk 6, which is only about thirty feet above sea level, so the risk is a little increased down at that level. After dinner, Yvonne and I had a drink and a natter until it was time to go to the cinema. We saw The Best Exotic Marigold Hotel, which was superb. Unfortunately, one of the speakers in the cinema has blown, so the sound was at half volume and accompanied by a significant buzz from the dead speaker throughout. Not ideal for the hard of hearing, so bearing in mind the average age on here, which although lower than on a long cruise, is still significantly up on the real world, the whole thing must have been very trying. And so to Harlequins, the nightclub, for the disco. Danced til three and hung out with some very nice people, although one Welshman told me I came from the wrong valley, which seemed a tad harsh! It was surprising how few people had obeyed the black and white theme. Normally most people obey but there are one or two who don’t grasp the concept. But last night, it was a significant proportion of the women present – maybe 1% or more. It is a shame, because there is an aesthetic that is being spoiled for everyone else. Black and white night is very pretty, and yet these people who simply cannot read the newspaper or don’t care or are deliberately being malicious and disobedient, mar it for everyone else. In the grand scheme of things, if that’s the worst thing that happens to me all day, I’m doing pretty fine, but it’s still a shame. Made the DJ finish with Happy Days, which made everyone smile. And so the cruise draws to a close. Tomorrow is the last day, a sea day, thank heavens, and the clocks will go back tomorrow night, so the early start on Saturday morning won’t feel like quite such an early start. I have a massage booked in the morning, not as early as Yvonne’s, though. I’m eager to have one, but not eager enough to be up at 9am. I am still on holiday, just. I am pretty much packed and I have received my disembarkation paperwork, so all that is left now is to download the last photos, use up the internet time and work out how I’m going to transport the rather fragile items I purchased on my travels. Which, as I am going home on public transport, is not an insignificant issue.